Due to my recent moods and events, I am now indulging in a comfort food, dark chocolate. Did you know that 300 chemicals that compose chocolate have numerous and varied effects on our bodies through the nervous system? Yes a good excuse to indulge in it….but truly, it does have good effects …especially dark chocolate..and I LOVE Dark Chocolate. I decided to research on chocolate and it’s effects on our system. 1. Anti Depressant - Eating chocolate increases the levels of endorphins released into the brain, giving credence to the claim that chocolate is a comfort food. The endorphins work to lessen pain, reducing the stress levels and enhancing the feelings of ecstasy. Another common neurotransmitter affected by chocolate is serotonin. Serotonin is known as an anti-depressant. One of the chemicals which causes the release of serotonin is tryptophan found in, among other things, chocolate. 2. 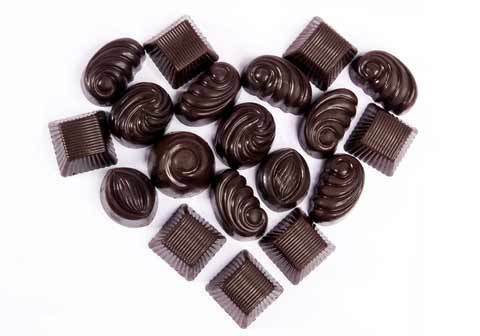 Love Drug - One of the more unique neurotransmitters released by chocolate is phenylethylamine. This so called "chocolate amphetamine" causes changes in blood pressure and blood-sugar levels leading to feelings of excitement and alertness. It works like amphetamines to increase mood and decrease depression, but it does not result in the same tolerance or addiction. Phenylethylamine is also called the "love drug" because it causes your pulse rate to quicken, resulting in a similar feeling to when someone is in love. 5. Lower risk of Heart Desease, Lower Blood Pressure - Dark chocolate is a rich source of the flavonoids--epicatechin and gallic acid--both of which have cardio-protective effects, and is also high in cocoa content. Moderate intake of dark chocolate has also been shown, through previous studies, to lower the risk of heart disease, relieve pain, lower blood pressure, and protect from skin cancer. 6. Relieves Chronic Fatigue - A more recent research finds dark chocolate helps relieve some symptoms of chronic fatigue syndrome. Chronic fatigue syndrome is a disorder that causes extreme fatigue which does not go away after you rest. It limits one’s ability to perform even the routine activities. 7. Cancer Prevention - Dark chocolate contains certain antioxidants called polyphenols that could help fight chronic inflammation of tissues in the circulatory system. Moderate amounts of dark chocolate might also play a role in cancer prevention. It is fascinating that a food such as chocolate can have such an effect on the operations of our brain and thus our perceptions of the world. My mood is way better now too since my last post. Go ahead, grab a chocolate bar. New evidence is in that eating dark chocolate every day can reduce stress.